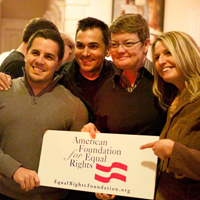 AFER was founded on the belief that there had to be a way to protect the fundamental freedoms of gay and lesbian Americans. One that would not be beholden to the whim of public opinion or political ideology. One that would stand the test of time. Never before had gay and lesbian American sought the fundamental right to marry in federal court. But the time had come. AFER recruited two of the most respected attorneys in the country to lead its legal team—Theodore B. Olson and David Boies, who famously argued against each other in Bush v. Gore . This partnership embodies AFER’s core belief: That Americans of vastly different political leanings can and should unite to stand up for the individual liberties guaranteed by our Constitution. This philosophy lifted the partisan veil from an issue that, for too long, had been shrouded in “liberal vs. conservative” terms, and began to redefine how Americans view marriage equality. Olson and Boies represent two couples who want to marry, Kris Perry & Sandy Stier and Paul Katami & Jeff Zarrillo. The case broke new ground with the bold decision to file in the federal, rather than state, court system. For the first time, state-sponsored marriage discrimination against gay and lesbian couples would be challenged in a trial that could have national implications. 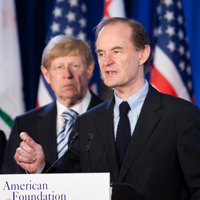 Olson and Boies argue that Prop. 8 violates the Due Process and Equal Protection Clauses of the Fourteenth Amendment to the United States Constitution.